1/72 Multiverse: O fish, are you constant to the old covenant? Even before the 1954 movie Creature from the Black Lagoon, Fishmen have been macking on human women. H.P. Lovecraft's Deep Ones are probably one of the earliest influences on the development of Fishmen in horror, and also the most successful in making inter-species relationships work. In the miniature world, there are many types of Fishmen that can be used as Deep Ones. A sampling of Fishmen in 25mm is shown in the images below. The first figure is a Deep One from the Grenadier Creatures boxed set (6502) for Call of Cthulhu, which has always been a favorite of mine. Next are three Fishmen from the Black Tree Design Fantasy Armies line (M150), and at the end is a Sahuagin from the Grenadier Denizens of the Swamp boxed set (2010). 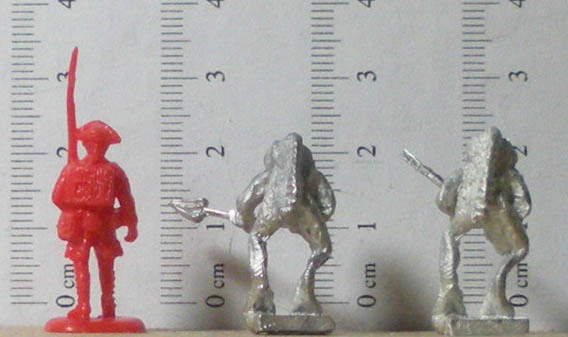 The Grenadier Deep One is broad and bulky, but I don't think it would be too out of place with 1/72 figures. The BTD Fishmen are somewhat different in appearance to the Grenadier figure, and larger, so could be used as more venerable Deep Ones. Of note is that it took over 6 months for the BTD figures to arrive (September 2009 to March 2010), so buyer beware. 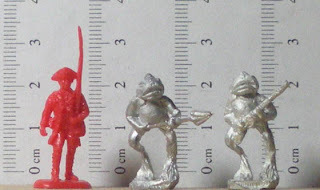 The next image is of two 20mm Fishmen Warriors from Elhiem Figures (P17). These figures are very compatible with 1/72 figures, and are actually very similar in build and appearance to the BTD Fishmen. Hopefully Elhiem will expand this particular range of figures. Elhiem also produces a Lesser Fishman, that is less fish-like in appearance, and which can be viewed at their website. Last but not least, are 10mm Fishmen from Pendraken. These figures were samples that were kindly sent to me by David Pengilley at Pendraken Miniatures. The Pendraken Fishmen are not as menacing as the larger Fishmen, and are pretty much normal fish with arms and legs, but in some ways that makes them somewhat more disturbing. Shown below are the Fishman with trident (FF3), Fishman gun with crew (FF12), Fishman with net (FF2), and Fishman with harpoon (FF4). These Fishmen are very large for 10mm, and may work better as 15mm Fishmen. I plan on using them as a servitor race for the Deep Ones. 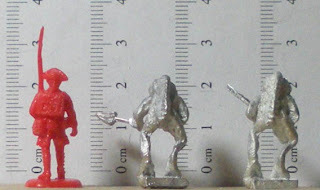 A comparison of 10mm, 20mm, and 25mm Fishmen.